US Dollar is still strengthening against its opponents after the decision of FRS to start the curtailment of quantitive easing programs. FOMC is going to reduce the volumes of assets purchase by 10 billion dollars next year, and interest rate will remains at the same level of 0-0.25%. Today the pair EUR/USD has tested two-week highs at 1.3624, but the Bears couldn’t break down this level. 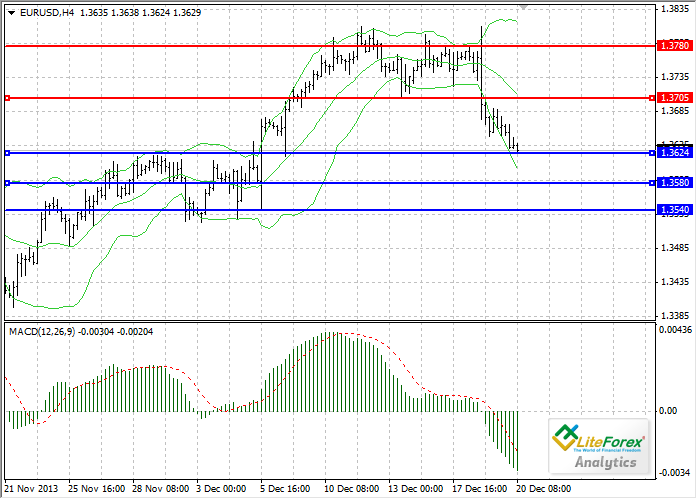 Support levels will be at the local maximums: 1.3624, 1.3580 and 1.3540. The resistance levels are 1.3705 and 1.3780. On the four-hour chart we can see a descending trend. MACD confirms the fall, it histogram is growing in the negative zone. Bollinger bands are directed downwards, giving a signal to sell.